Shulchan – שולחן. Omer Miller’s Rothchild Street restaurant invites you in with its minimal decor, and unpretentious atmosphere. The service is attentive and kind, and the minimal menu changes daily, filled with simple, easy to understand dishes that feature local and in-season ingredients. Whether it is beet carpaccio, black lentils, chicken skewers, tomato pappardelle, red tuna tartare or the delightful pumpkin pasta “sweets” each dish delivers on presentation, and taste. One particular item, the Egg-Schnitzel, Shulchan’s most popular dish is perhaps the only item on the short menu that might require some clarification – A poached egg with a runny center coated in a traditional bread crumb coating. One of Shulchan, Tel Aviv’s outstanding features are the large glass windows facing Rothchild street. 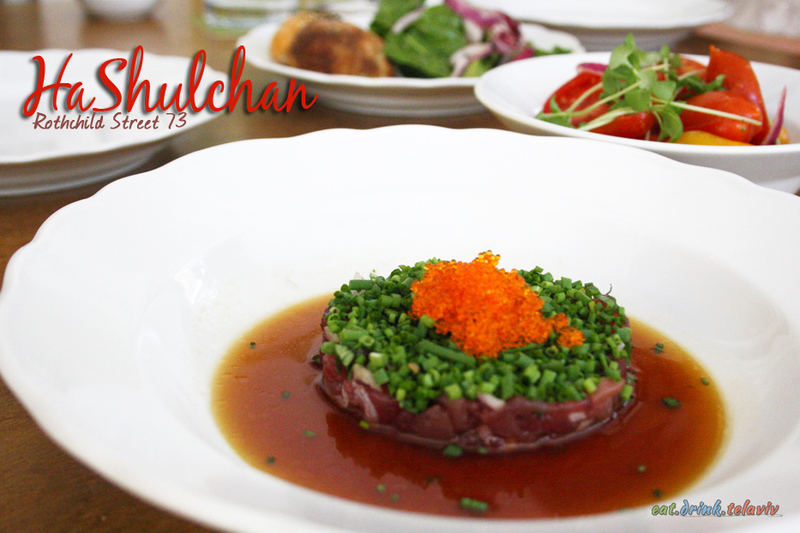 During the day the restaurant Shulchan is filled with beautiful natural Mediterranean sunlight. Perhaps a testament to its namesake (Shulchan means table) this simple feature creates a beautiful blend of comfort for the guest giving this lovely impression they are feasting in their own home, dining at their own kitchen table. At lunch time, the natural light spotlights the food giving all the necessary attention it deserves. Cherry tomatoes pop in full reds and yellows, the micro-greens and spinach flourish and feed the eye. 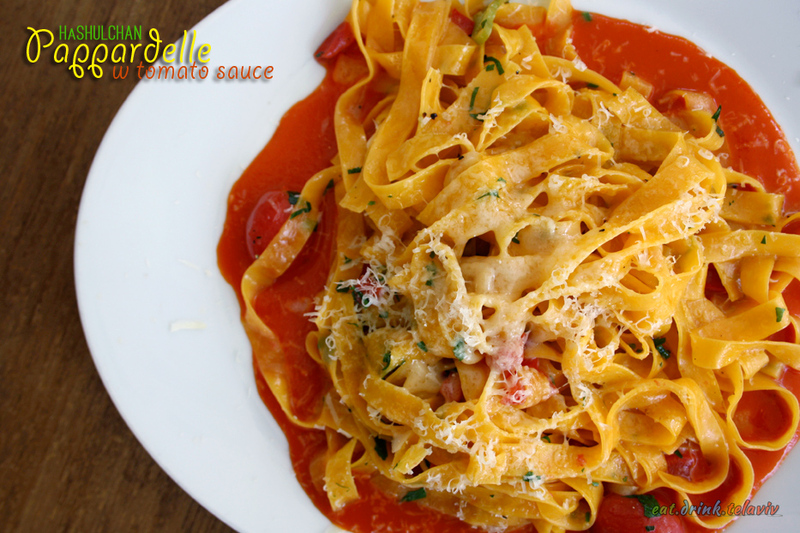 Pasta dishes filled with creamy orange sauces and noodles will awaken your appetite. The lunchtime special offers a great opportunity for many to enjoy Shulchan’s delicate dishes (compared to the more expensive dinner menu prices) with starters and a surprisingly affordable dessert add-on. 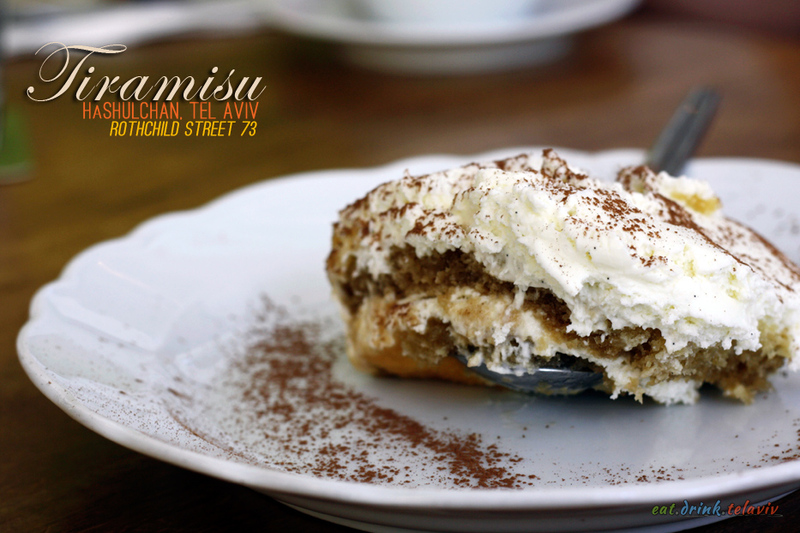 For 15NIS more we indulged in some very well made light tiramisu. 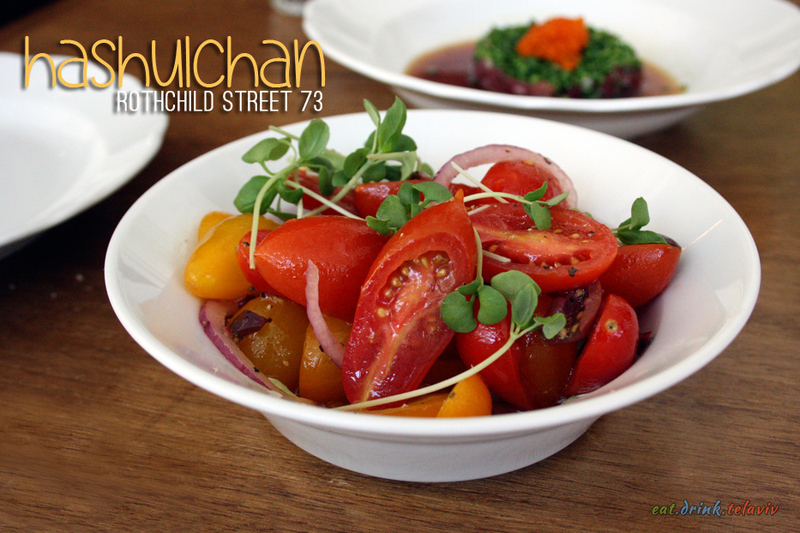 Shulchan is centrally located on the popular Rothchild Street. 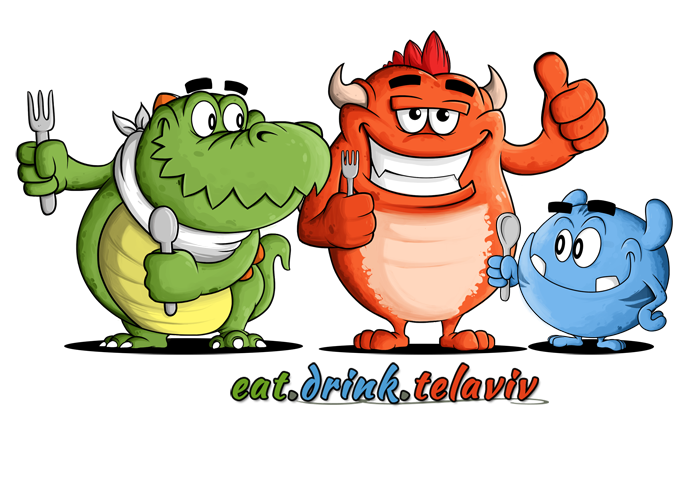 The Tel Aviv restaurant is ideal for treating a visiting friend from out of town to a fantastic midday meal in surrounded by peace, quiet and comfort, while still situated in the hub of Tel Aviv. Word travels fast in Tel Aviv, and many were surprised I had not dined at Shulchan (Table) or as I kept and have continued to call it HaShulchan (The Table) giving it perhaps a more formal title than it deserved. The restaurant on Rothchild Street often went unnoticed. There is no large name calling out to you as you walk the pedestrian street. The name is simply displayed on the large windows of the restaurant and it just blended in with the surroundings. You could walk past it and not think it is a restaurant but someone’s porch, a private home filled with friends. I meet up with a friend who has one of her closest friends from out of town visiting. 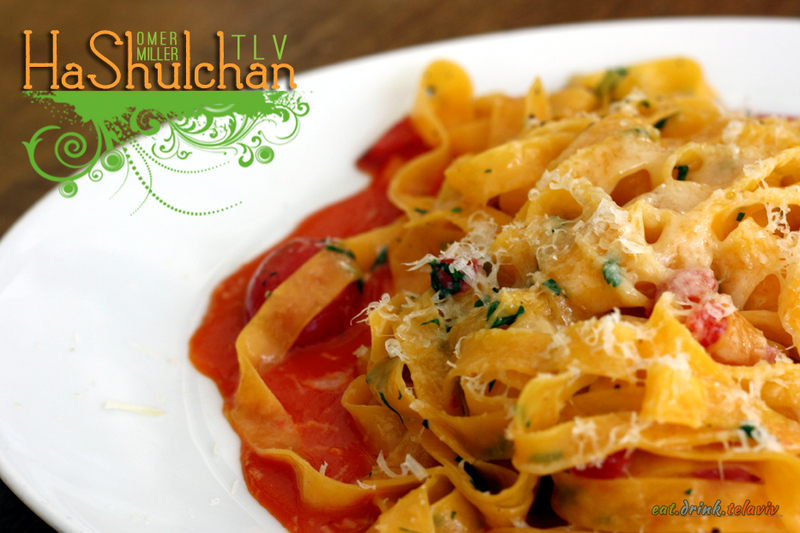 Lunch time at Shulchan, Tel Aviv is a perfect choice – treat your visitor with Mediterranean fare with a subtle twist at a popular chef restaurant during their business-lunchtime special. 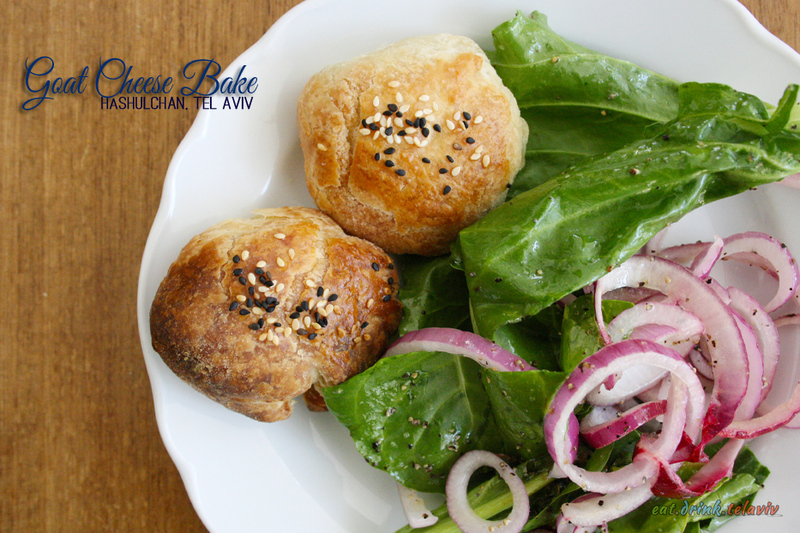 A starter and an entree for about 68-78NIS with options for upgrading and adding a dessert. And upgrading might be something to consider. The basic starters are uninspiring but at the very least delicious. 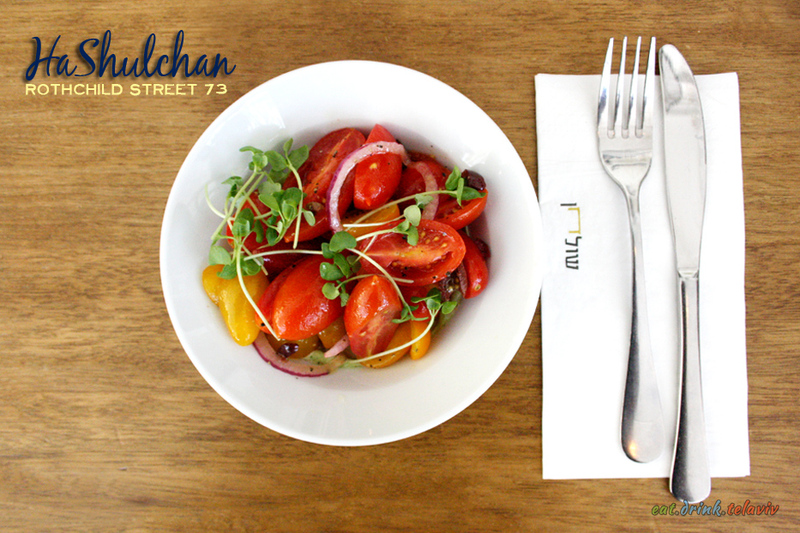 The basic cherry tomato salad with the basil aioli, purple onion and kalamata olives was a bright refreshing start. It was interesting to see how even slicing the tomato slightly askew can change the way you experience the dish. 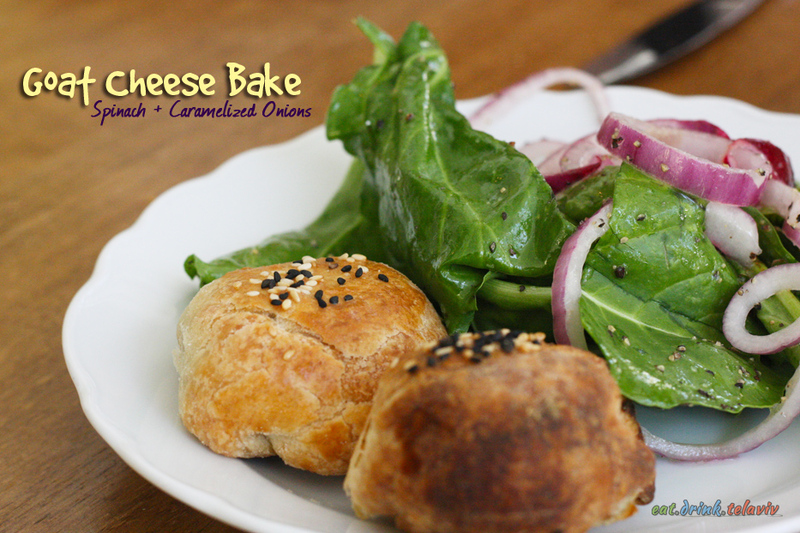 The Goat Cheese bake with spinach and onions was tasty, but like the basic salad not something you would consider at a chef restaurant. 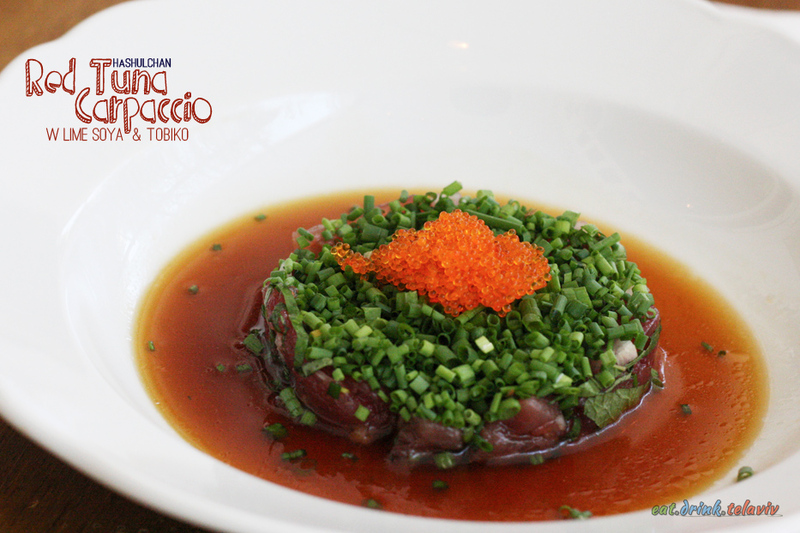 However, the Red Tuna Carpaccio with lime soya and tobiko (+18NIS) was a beautifully served dish with lovely textures with the small pop from the tobiko and a sweet subtle sauce that brought out the rawness of the fresh fish. 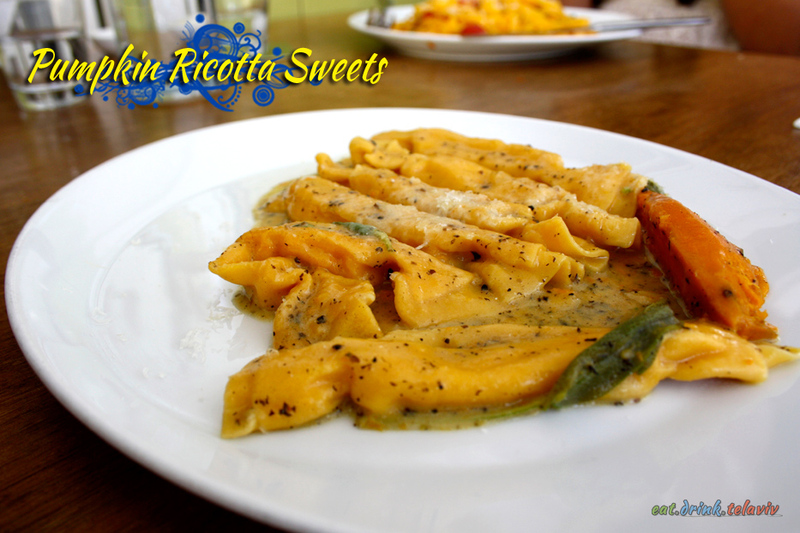 The pasta entrees were all Fresh, warm and so soft, each dish melting in your mouth. 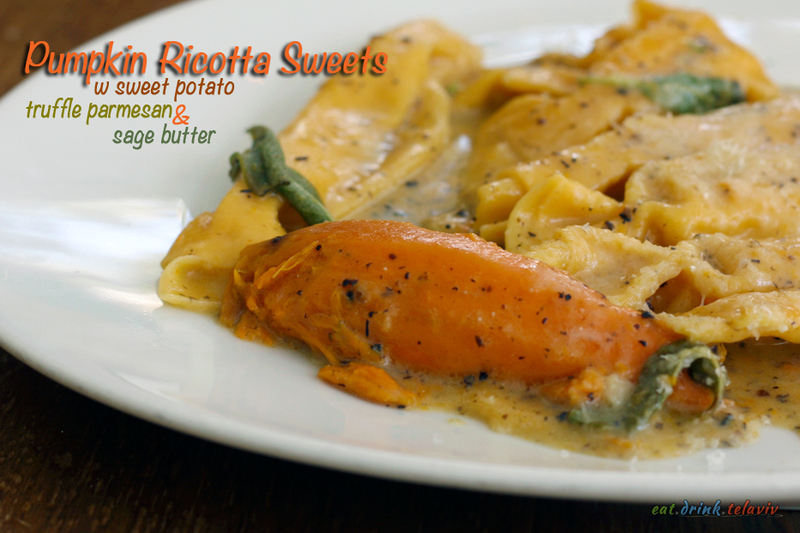 The stand out was the Pumpkin ricotta “sweets” – the delicate and rich flavour of the sweet potato in fresh pasta wrapped to look like candy. For dessert, the Tiramisu (+15NIS) was a rich indulgent treat but worth the small charge. It is rare to find such a luscious tiramisu at that price. The cream was light and bright white, with deliciously espresso soaked “lady-finger” like cake. This subtle change gave the dessert more of a balanced texture and allowed it to maintain its moisture. 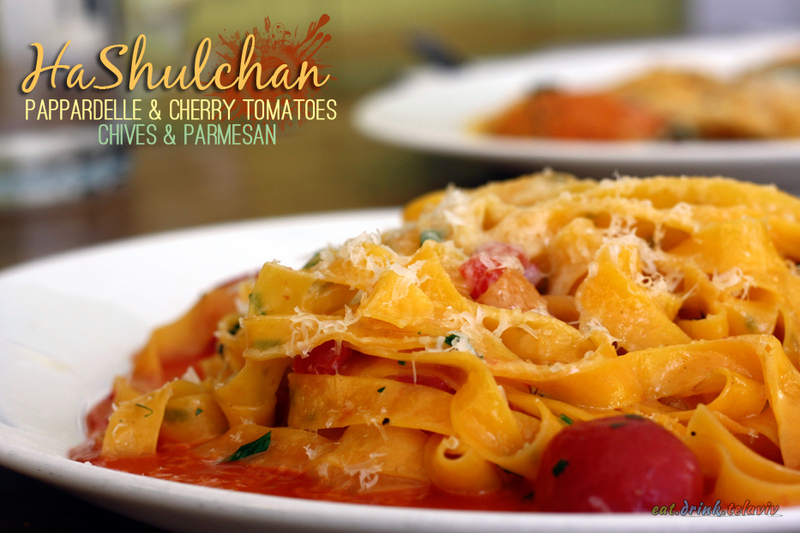 For a non-Italian restaurant Shulchan delivers some incredible Italian dishes – from start to finish. Chef Omer Miller, owner of Shulchan and Cheder Ochel (Dining Room) gained a lot of notoriety for his appearances on the Israeli television. While his food is incredibly well done, and he has established two popular chef restaurants, they are priced as such without perhaps indulging the diner in some of the frills that usually accompany a chef restaurant. 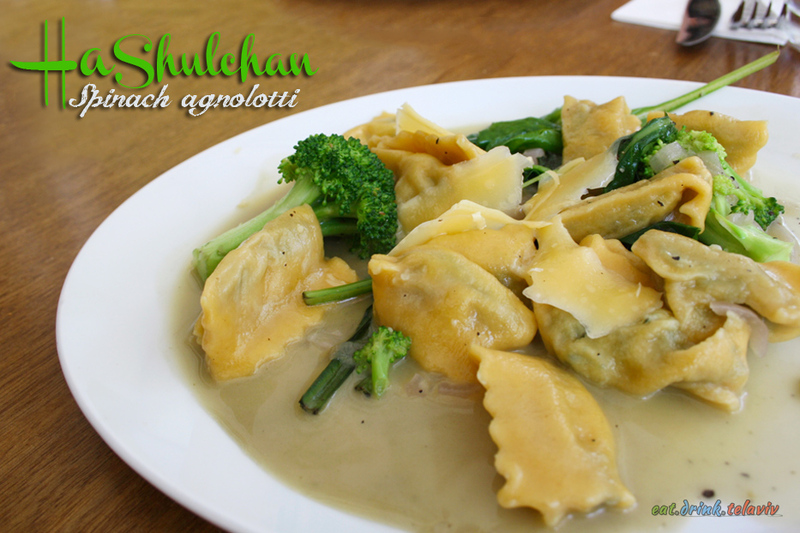 Overall having pasta for lunch seemed like an expensive endeavour, but with some stand out dishes, outstanding service in a inviting atmosphere, HaShulchan, Tel Aviv is definitely a table one should try.